John De Andrea's sculpture, "Three Dancers," on the third floor of the Ellie Caulkins Opera House in Denver. If you've ever caught a performance at Denver's Ellie Caulkins Opera House, you may or may not have noticed the giant statue in the lobby. Denver painter Carrie MaKenna stands in front of the piece dedicated to Maria Mosina, who danced with the Colorado Ballet for more than 20 years. KUNC's Stacy Nick talks with artist Carrie MaKenna about women in public art. "John De Andrea makes sculptures that are very, very lifelike from the subjects that he works with and so it looks exactly like them down to fingerprints," MaKenna said. The sculpture features Mosina gracefully perched high in the air, held up by her husband and dance partner Igor Vassine. It's just one of many pieces of public art that can be found in the Denver Center for the Performing Arts complex alone. But MaKenna said it's still a rarity. "There are a lot of pieces of public art that have women in them, but they aren't specific women," she said. "So they're either allegorical or they are representative of a genre of women. So there's a really great statue in front of the Colorado History Museum that's about Colorado teachers. But it's not a specific person." Upstairs on the third floor is another De Andrea sculpture, "Three Dancers." This piece, which features three female ballet dancers rehearsing, exemplifies what most public art depicting women is made up of, Makenna said. "Even though these are specific women, because John De Andrea actually does that — he casts pretty much from live people — this isn't considered one of the public art pieces that commemorate(s) specific women," she said. That representation matters, MaKenna said. It's important to honor the impact women have had on the state and to educate people about their stories in a real and public way. So when MaKenna inherited the AZ Foundation from her parents, she decided to refocus the organization's mission from education to the commissioning and creation of public art works honoring specific Colorado women. Because it's unknown exactly how many pieces of art currently honor Colorado women, one of the first steps will be cataloguing a complete list of all the pieces already out there. 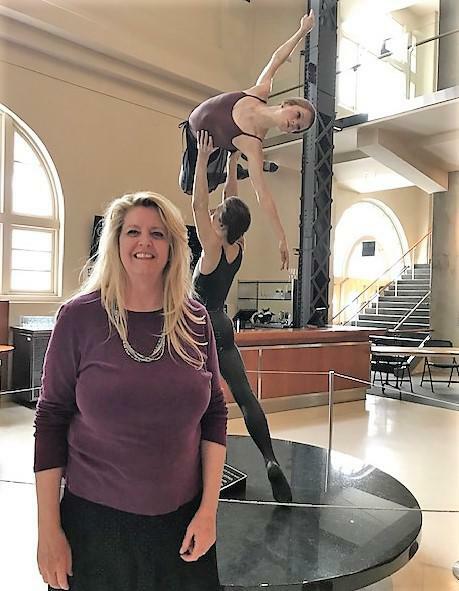 Carrie MaKenna stands in front of a statue dedicated to dancer Maria Mosina in the lobby of the Ellie Caulkins Opera House. MaKenna said she sees the new direction as a way to honor the strong women in her state, as well as in her own life. "I'm a fourth-generation Colorado native and my great-grandmother came here to escape Ireland," she said. When she came to Denver, MaKenna's great-grandmother ran several businesses in the historic Baker neighborhood including a grocery store and a mechanic's shop — a rarity for women at that time. "So she was kind of a force to be reckoned with back in those days and this just felt like the perfect direction to take this foundation," she said. MaKenna added that women won't just be the subjects of these works. "Being a woman artist, I'm very interested in choosing women artists as often as possible to create these pieces," she said. As for choosing which women to honor, MaKenna has found a deep well to draw from thanks to the Colorado Women's Hall of Fame, which already has more than 160 inductees. "Colorado has a very strong history of very strong women," she said. Bonfils has already been the subject of many private works of art in her name. 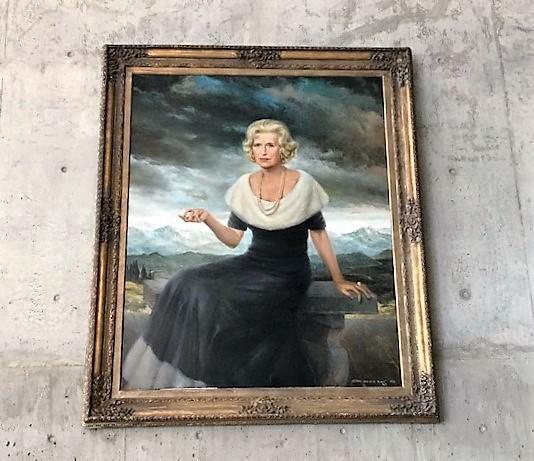 Across the DCPA complex, in the theatre that bears Bonfils' name, sits a striking portrait of the heiress with the Rocky Mountains in the backdrop. A portrait of Denver philanthropist Helen Bonfils hangs in the DCPA's Helen Bonfils Theatre Complex. The painting is rumored to be haunted. "If you stare at it long enough, the clouds will move," said Suzanne Yoe, the DCPA's director of communications and cultural affairs. Bonfils was one of Denver's biggest philanthropists at the time — particularly for the arts. "Helen Bonfils actually created the theater over on Colfax, which is now the Tattered Cover," Yoe said. "It used to be the Bonfils Theatre, and it was actually opened in honor of her mother. She also founded the Bonfils Blood Bank." Another contender is former University of Colorado-Boulder basketball coach Ceal Barry. Barry retired from coaching in 2005 holding the record for coaching the most games, matches or tournaments of any sport in Colorado athletics history. With 427 wins, she also had the most victories of any CU-Boulder coach. "There's name recognition around the state, and also kind of an already understood implication of her importance to sport in Colorado," MaKenna said. Now all she needs is some art. The AZ Foundation will meet at 1 p.m. March 30 at First United Church of Arvada.